Publishing and distribution of this article requires approval from OPDAG. Because I have always learned better and faster by seeing rather than reading, I have attempted to show you the process of developing a paper doll by showing each step and noting details. I shall not go into the logistics of drawing an architecturally correct figure, because there are many good books available on the subject. I also urge anyone, whether new to drawing or very experienced, to take life drawing classes to learn to draw the human form firsthand. Next best is to draw the people around you, and next best is to draw from magazine photos. If you feel it is quite impossible for you to draw a figure at this time, and you are desperate to draw a paper doll NOW, you may enjoy tracing figures from fashion magazines or catalogues. If you choose to do this, be creative and use a head here, an arm pose there, and move leg direction so what you finally have cannot be connected to the original sources. Be sure that once all the parts are put together, they make sense and have good balance. One way to check your work is to look at your drawing in the mirror. Some mistakes really glare back at you this way. In keeping this exercise as simple as possible, I have used easy to access supplies: white copier paper, tracing paper, #2 pencil, white art eraser, and Faber Castel's Uni-Ball pens, sizes Fine and Micro. And to hold down the tracing paper, Scotch's blue-label Removable Tape. (A light box may be used instead of tracing paper). Draw your figure and undergarments in pencil on copier paper. Use a fairly light touch, so pencil can be erased. Use micro pen to carefully draw the finished line work over your pencil sketches. Use heavier pen to deepen shadow areas, under chin, breasts, shoes, and to darken any area desired. Keep facial lines simple and to a minimum. Leave white highlight areas on hair - do not completely fill in with hair lines. Do repairs with white out. I use Liquid Paper, red bottle (for copies); it seems to work just fine over the water-based ink. Taking a look at your figure, note areas on the high sides where tabs may go. When you remember how you may have walked your paper dolls about while trying to keep clothes on, you will know that tabs need to be on the upper edges, in order that gravity not pull the clothes off. Also remember: don't make a tab longer than the width of the member it embraces. Think of a long tab on a skinny wrist -- it will show on the opposite side of the arm when you bend it under. There are also the kind of tabs that tuck behind the figure rather than folding over. These are helpful when part of the fabric or fur wraps around the body (or arm or leg), and a regular tab is not suitable because the garment sticks out past the edges of the figure. Whether you use tracing paper or a light box with opaque paper, follow these same guidelines. The illustration shown here is an actual photocopy of the doll with a tracing paper overlay of the pencil costume (before inking). With this I hope to show you not only how to tab and tuck, but to follow the contours of the figure to create garments that appear to be all around the doll instead of just lying on top of it. See how the boots curve around and droop a little at the top. See the fur wrap around to the back sides of shoulders, head and wrists. Note the tabs on the topmost edges of the figure and the tucks in areas where the garment extends beyond the body. I have drawn the costume fairly heavily in #2 pencil, which is soft and rather dark, so that my copier will pick up the color so you can see it. You will want to handle your pencil with a lighter touch than I have, just so long as you can see your sketch lines for inking. You may use the Uni-Ball, as I have, or another pen of your choice. Think of form, light and shadow as you draw. Light usually comes from above, so darkest areas will be on under sides, which are in shadow. I generally imagine a light coming from the upper right hand side, for continuity of light effects. Though on this costume it looks like my light is more from the upper left side. Whichever, just keep your shading consistent. Carefully use a white art eraser to remove all pencil lines. I do a small section at a time, between my thumb and fingers, because the tracing paper is so easily crumpled. Also, wait until the ink is very dry or it will smear, leaving more repair work to be done. Cover smudges, over-drawn lines and other unwanted items with white-out, and add any other details, line work and shading after pencil has been removed. Any remaining pencil can be picked up by the camera or copier and will mess up the final copies. A copier is a very handy tool to have when doing black and white PDs. I have kept its use to a minimum (or none at all) in these instructions. One thing I almost always do, however, is to do my drawing larger than the finished layout. The figure I worked on for this PD is actually 10 inches high, then reduced by 70% before cutting and pasting onto the layout with borders and all. After reducing the doll and costume onto plain white 20# copy paper, I may do further inking. As tracing paper can sometimes be difficult to draw fine line lines on, it's nice to have the more accepting surface of the 20# bond to work on. I'll add shading, clean up edges, widen some lines and add fine detail with the Micro point Uni-Ball. Another thing I use the copier for, is to copy the doll full size onto plain white paper. I use this for doing the costume over-lays and for inking. Having the doll right there under the costume while doing final inking aids perfect fit. But using a copy is safer in case the ink bleeds through while drawing. It would really be upsetting to mess up the original. 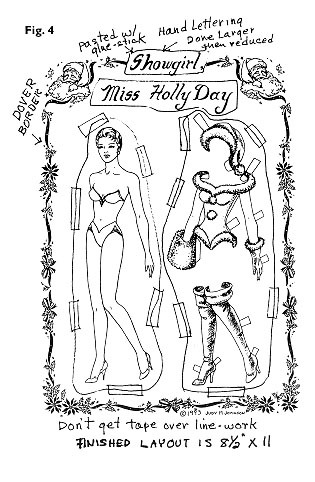 To complete your paper doll page, you can use cut-and-paste methods to arrange the components of your final layout. Components are: Figure, Costumes, Lettering and Titles, Borders and Trims. You can do your own hand lettering if you are very neat, or computer generated lettering. There are various brands of press-on type, which you can buy from art and office suppliers in many type styles that work well for PDs, too. These can be cut and placed where desired. I use Scotch removable tape for placement of components because it's easy to change and move about. If you prefer a more permanent layout, use a glue stick that is acid free, to prevent any future yellowing. (Rubber cement is toxic to you and your paper, so we never recommend it). Remember to keep any design (line work or words) at least 1/4 inch away from edges. If you work larger, and will reduce final art - say 11 x 14 reduced to 8 1/2 x 11 - leave at least 1/2" plain white border all around. This allows for imperfect placement while printing, and gives the press a "grab" edge, if being done at the printers. Dover books and other clip art books such as Graphic Products Corp. offer endless possibilities for textures, borders, trims and even lettering to enhance your paper dolls. Using them can make even simple art work appear more professional. I urge you to get some that appeal to you and play with them. It's OK to copy what you want from pages of copyright free books, so you can cut and paste them on your work without destroying the clip art books. Sign, date and copyright mark each page of your work in this order: (D 1998 Jane L. Artist. If you are making a limited edition, leave a place in the design just for that. If it's an edition of 50, hand sign; 1/50 Jane L. Artist, 2/50, 3/50 etc. Then do not print any issues beyond that number, unless you change it, add more costumes, etc. to create another set. Have fun!